Big cable and telco companies, in bed with captured legislatures, are actively slowing down the arrival of iTV in the US, Australia, and several other industrialized countries dominated by Big Media today. These deviants are trying to keep our internet bandwidth below 100Mbps for as long as they can, because around that number, TV-quality internet streaming video platforms can emerge, platforms with millions of channels, and which use much more clever and lower cost methods (highly personalized and localized commercials, subscriptions, micropayments, AdSense, etc.) of monetizing custom video content. iTV will take away Big Media’s monopoly of the living room screen, and will massively fractionate their TV advertising market. It will also create an environment that will support hundreds of thousands of new, independent, full-time specialty video producers, remixers, and commentators, and facilitate massive new entertainment and nonfiction (education, documentary, civic engagement) video subculture emergence. This is something the 99% can get very excited about. Unfortunately, US consumers so far have been slow to adopt any form of “lean forward” television, where they have to occasionally lean forward in their chairs to search for content using the keyboard. Google TV adoption, for example, even though it is a relatively inexpensive move away from the closed telco set-top box, has been a lot slower than some expected. Logitech lost $100M on their Revue box for Google TV in 2010, and have announced they’ll be pulling out. They made far too many of them, and learned that the consumer is far less interested in messing with yet another incrementally useful household gadget than they anticipated. I really like my Revue, it has served us well all year, and Logitech could have built some good will by serving its small customer base a lot better this year, and teaming up with Best Buy or another electronics retailer to work out installation deals to get them into more houses. But I’m in that 3% of Americans (and rapidly rising) who watch TV shows online but don’t have cable, often on principle. Had Logitech focused on us, the best market for Google TV at present, they’d have found a willing audience. No matter, LG Electronics and other hardware makers will step in for the next version of Google TV, which will only get better faster, now that a new Apple TV is in the works for 2012. Consumers are waiting for better “lean back” experiences, where the platform will automagically decide what they are interested in, and feed it to them, and they can occasionally give feedback to it, preferably by voice. They’re waiting for Xbox and Apple to wow them with something totally simple and easy to use. This will happen, but it will also be something that is quite closed. Not as bad as the cable companies present offerings, but not nearly as open as the web. What we can continue to expect from the big corps, excepting the few, like Google, whose business model revolves around openness, will be more bread and circuses, while the media plutocrats keep the system rigged in their favor, and the little guy keeps getting shut out of the living room video marketplace, and 21st century social diversity, specialization, collective intelligence, and democracy continue to suffer. How do we help the tech literate, discriminating consumer, the 20% who are opinion leaders, see that the current Big Media-run TV universe, with $60B of annual TV advertising in the US alone, and endlessly repetitive ads for far too many crappy products, is going to inevitably be remade into something that is far more customized and relevant to each of us? How do we get them to see the value of TVs that have both amazing lean forward features (even if only occasionally used) and very intelligent lean back features, and that are truly open video marketplaces? How do we accelerate the irreversible developmental move to a platform where lots of money flows not only to studios, but also to hundreds of thousands of small company specialty video producers, and where ads become so diverse and specialized and local and context sensitive that they aren’t ads, but education? Once the bandwidth arrives, I expect (and hope) that better and far more open iTV platforms will be built, and people, starting with the youth, will migrate to them in droves. Big Media will likely still get 80% of the revenue, and provide 20% of the “fat head” of the distribution. But we’ll also have lots of Little Media, getting 20% of the revenue, and delivering 80% of the variety, the “long tail” of diversity on the video web. And we’ll have a different kind of Big Media, corps that have adapted to a more service-oriented model, or died. The world will be a much smarter (and more entertaining) place. 1 million+ specialty video channels on your TV. A worthy video platform for a 21st century democracy. Americans spend half their free time watching TV. They need much better and more specialized news, entertainment, and education. We all need the ability to like, dislike, and ban any types of ads that come into our home that we don’t want. Only ads you care about will be allowed into your home. Finally. 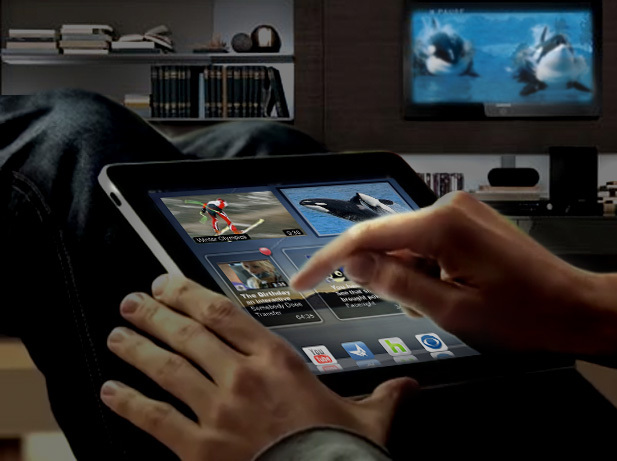 Our tablets, smartphones, and laptops will become our iTV remotes, and our game controllers for amazing new iTV games. Social viewing, chat, and collaboratively filtered recommendations will be central to the best open platforms. Facebook, Google+, Twitter, etc. will help us find good content. We need user-customized commercials, with half-muting, or full muting with captions, of whatever duration we want (10, 12, 18 mins per hour, etc.). Watch more commercials, you automatically get access to more expensive, ad-supported content. Want to watch less ads? Pay a channel subscription, or micropayments for premium video. Realtime customized captions & sidebars. Never again watch news, or politician’s harangues, without great social commentary and analysis running in realtime in the side bar. Open source video licenses on video content will bring peer-to-peer, mashup culture to video, and greatly improve video content. If copyright holders offer a rental license to anyone, they must also offer a remix license, priced no higher than the rental license. This is law in some states, based on the editing licenses that Hollywood sells for edited versions of movies that play on TV, in airplanes, etc. This needs to become federal law, to empower global remix and editing culture. It’s time for a hundred competing specialty channels of [your interest here] TV! • 20 min video, The Television Will Be Revolutionized, TEDx Del Mar, 2010. Below is start of an interview I did last month with Phil Bowermaster and Stephen Gordon, my futurist friends who run Speculist.com and Fast Forward Radio. The topic was human destiny, and the personal and social value of cultivating a big picture, acceleration-aware view of the world and our opportunities within it. You can find the full text interview here, at WorldTransformed.com, and listen to a related Aug 31st, 2011 audio interview, on a panel with fellow futurists Venessa Miemis and Robin Hanson, at WT2: Human Destiny Transformed. Thoughts? Responses? Please feel free to use the comments section here, at my new blog home, and I’ll do my best to respond. Thanks! 1. If you were to pick just one current or coming transformation that you would advise people to focus on, which one would that be? I run the Acceleration Studies Foundation, so I’m a tad biased, but I would say one thing to focus on is to try to understand the meaning, risks, and opportunities presented by accelerating technological change, in your own life and in society. Accelerating change is causing a whole number of transformations today, and several of these are giving us more options for what to do and how to live than we’ve had at any time in the past. Others (automation, globalization, fossil fuels, IEDs) are causing disruption in more ways than ever before. Read Martin Ford’s Lights in the Tunnel, 2009, for one of many thoughtful works on the way technology improves us in some ways, while disrupting us in others. When you think carefully about accelerating change, you may conclude, as I have, that just a few technologies, specifically computing, communications, and nanotechnologies, are continually accelerating because every new generation of these particular technologies uses less resources per computation or physical transformation than the previous one, a phenomenon I call STEM compression. So these special technologies continually escape the “limits to growth” we see in traditional technologies. And it is these same technologies, as they perennially accelerate, that increasingly shape our future. We can think of them as the growing framework, or cage which restrains and directs all the most powerful actors today, the corporations, the governments, the ultrawealthy, the terrorists, everyone. Our parents saw minicomputers, cheap telecom and the PC fuel the growth of multinationals, and at the same time, flatten corporate hierarchies. We’ve seen the iPod and internet disrupt the music industry, tablets are now starting to change the publishing industry, and as I argue in How the Television Will be Revolutionized, 2010, a few years from now iTV will disrupt the television and film industries in even more powerful ways, bringing millions of channels to every device. Blogs, Wikis, virtual worlds, mirror worlds, social networks, and other facets of the internet are flowering and enhancing our collective intelligence. Twitter gives us a window on the thoughts of humanity. Smartphones connect us 24/7 to each other and the web. Sensors are proliferating across the planet, making every nation a transparent society. Lifelogs, wearable computing, telepresence, and augmented reality are just now emerging. Today, Facebook and Twitter empower the Arab Spring. Tomorrow, we’ll have a conversational interface to the web, and cybertwins (digital assistants that model our personality and can act and transact for us, at first in simple ways, later in very intelligent ways) assisting us in our information consumption, communication, commerce, and political activities. We can expect a valuecosm to eventually emerge, quantitated versions of the publicly expressed values that each of us all hold on all kinds of topics, allowing us to connect with others who share our values, to work with others on projects that we care about, and helping us to generate a whole new level of specialization and subcultural diversity. [The rest of the interview].